Throwback review from March 2014 - I have the sequel and have yet to read it. So exciting!!! 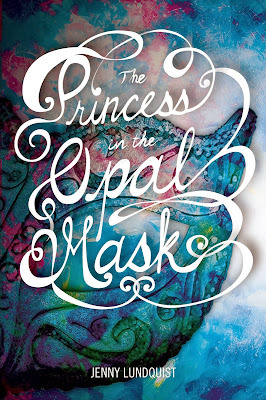 The Princess in the Opal Mask is a YA historical fantasy by Jenny Lundquist. Just as with Jennifer A. Nielsen’s Ascendance Trilogy, this novel has a sense of a fairy-tale, of a fantasy, but does not actually feature any magic or enchantments. Somehow we all put it in the fantasy genre anyway; I suppose because it just has that vibe and time period sense. Anywho, I LOVED THIS BOOK. Let me tell you a little about it, hmm? Princess Wilhamina, since she was introduced to the kingdom of Galandria as an infant, has always worn a mask. Over the years this has caused rumors to rampage from speculating that she must be horrendously ugly, that a look upon her face blesses others, or the one that speaks to Wilha’s deepest personal fears – that those who look upon Wilha’s face die. Elara, orphaned as a child in the crumbling village of Tulan, has spent her life becoming numb. Living with the cruel Ogden family, Elara has endured things that have left her broken off mentally from others – and no longer able to connect to the one friend she did have. Elara desperately wants to know the truth of her identity and escape from her surroundings, and she’ll use her dagger if she has to. As talk of war or peace between Galandria and long-time nemesis of the kingdom Kyrenica increases, Wilha and Elara unknowingly are led to meet. And when they do, everything changes. There is a chance for both to possibly improve their futures – but there are risks. When I went into The Princess in the Opal Mask, I admit it – I didn’t expect that much. That sounds terrible, but sometimes as a bibliophile you can get a little jaded. It only took a handful pages to turn that thinking around. Initially I was unsure of the writing quality, but then the utter hostility of Galandria’s people and the sad mystery of the princess constantly wearing a mask intrigued me and added to an edgy grit that The Princess in the Opal Mask quickly proved to have. There is a LOT of questions and secrecy, and I have to say – it worked for me. I liked the romantic element of both characters, and with time came to appreciate both Wilha and Elara – despite Elara’s acidity and hardness due to the life she’s endured. There was some heavy character development here, which I really, really valued. The Princess in the Opal Mask has a ton of danger, conspiracies and intrigue going on. Mix that in with convincing bitterness, resentment and cruelty done very well and we have a plot that is sharp and stinging both on a personal and epic level. I came to care for both Wilha and Elara and be in deep suspense as we followed their switching narrative voices. I don’t want to give anything away, so I’m being purposefully vague – but please believe me when I say it was awesome. The Princess in the Opal Mask is engrossing, addictive, gripping and surprising. I LOVED IT!!! Happily, there is a sequel mentioned to be released Fall 2014. I want it ASAP!!! Hopefully you’ll feel the same.